The French developed the glass cloche, or bell jar, formed of a solid piece of glass shaped like a dome. The purpose was to protect an early garden plant from bleak cold and frost. This would hasten their crops to maturity. The Dutch and English expanded the idea with handlights, lantern style, faceted pyramidal covers made from glass panes and frames of cast iron. How in the world do you pronounce Cloche? According to Webster's it is \ˈklōsh\ and rhymes with gauche. Now that we now all of that, how about making one of your own? 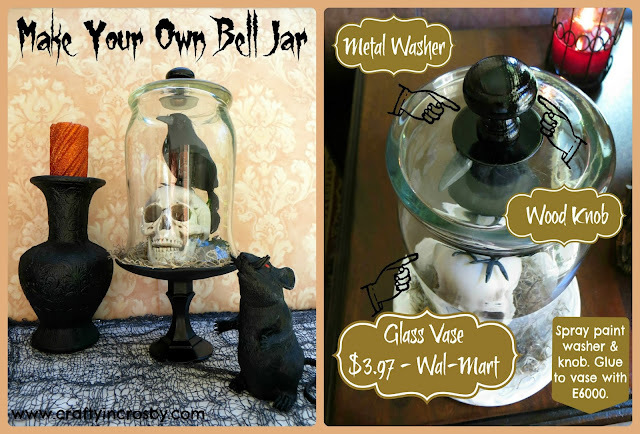 I've been wanting a bell jar for ages, but couldn't find one for an affordable price. With the base, I spent less than $6 on it, not including spray paint and the E6000!!! Now that's my kind of price!!! The vase is approximately 8" high by 5" wide. The washer and knob were spray painted with glossy black paint and then glued on to the bottom of the jar (which is now the top of your Cloche). That's all there is to it. The base is a thrift store saucer glued on to a Dollar Tree candlestick with E6000, then spray painted. Wally World, a Dollar Tree crow and a little Spanish moss! Hmmm..... now we need a larger one and a smaller one!!! The smaller one could be a rose bowl from Dollar Tree and I'm sure I could find a larger vase. Guess I'll hit the thrift store and see what I can find. Super cheap and easy! My two favorite words! ADORE this! Halloween is my absolute favorite holiday. When I was searching for dollar crafts the other day I saw the bird and almost bought him! If you have time you should try and link up at The Blog Strut, we would love to have you! I also voted for you on the picket fence and pinned this to our Halloween board! This is nifty and thrifty! Very cute! Thrifty is my middles name - ok, really it's just cheap!! LOL!!! Thanks for stopping by! Wonderful idea!! it looks terrific and such a thrifty crafty decor. 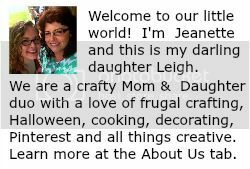 We just love it JoAnn! It looks creepy and spooky but can also be used again for other holidays. Thanks for stopping by! Love the vase you found for this! Such a pretty cloche! This is pretty amazing! 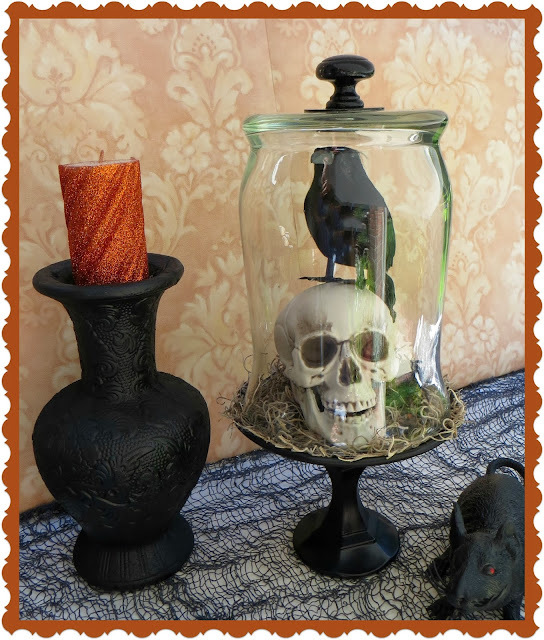 I love the raven, skull, rat and candle together. Great job. You are also my pick to feature at the Retro Re-pin Party, so be sure to stop by Somebody's Dinner next week and see this featured! Halloween Party 2013 - Photo Booth Fun! Sally Skeleton - Ready for the Halloween Bash!